Favorite Moment: When he came out and danced with us! Also, consulting with us near the end about what we wanted to hear. 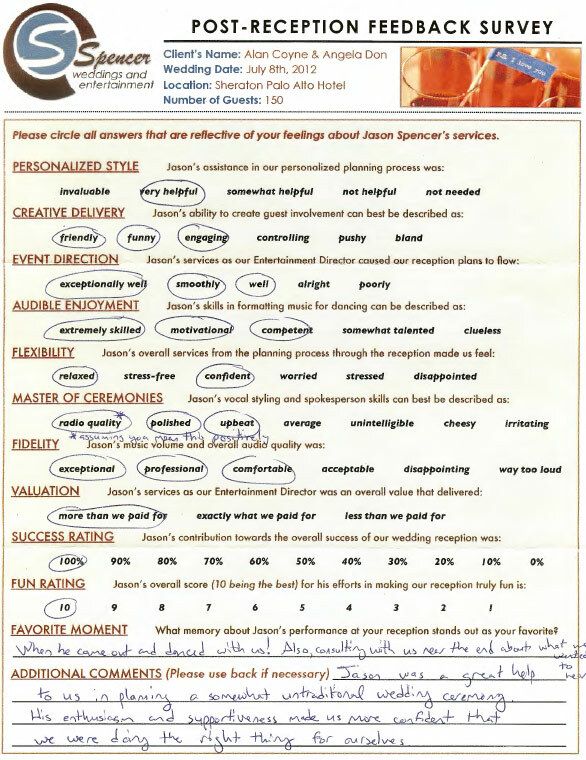 Additional Comments: Jason was a great help to us in planning a somewhat untraditional wedding ceremony. His enthusiasm and supportiveness made us more confident that we were doing the right thing for ourselves. We planned a fairly unconventional wedding ceremony, and Jason’s enthusiasm & flexibility went a long way towards not only making it possible, but making us feel at ease with our decisions. He’s a total professional who takes his job extremely seriously, while at the same time making it a fun experience for his clients. He managed to find just the right balance between advising us on our ceremony and reception while listening to our ideas, coming up with good suggestions when we needed them but also being flexible enough to incorporate the things that we wanted. Even though he’d never done a ceremony quite like ours, he stepped confidently into the challenge, and everything went perfectly. I whole-heartedly recommend Jason to anyone who wants a DJ/MC who won’t just show up, but will go the extra mile towards making your wedding exactly how you want it.